Fishing conditions on the River Moy didn't change much since the previous week. High water levels still impacted on the tidal beats with the rest of the river fishing quite well. Three generations of the Jordan family (grandfather, father & son) from the UK enjoyed 5 great days fishing on the Mount Falcon water catching a total of 22 salmon using a range of different methods. 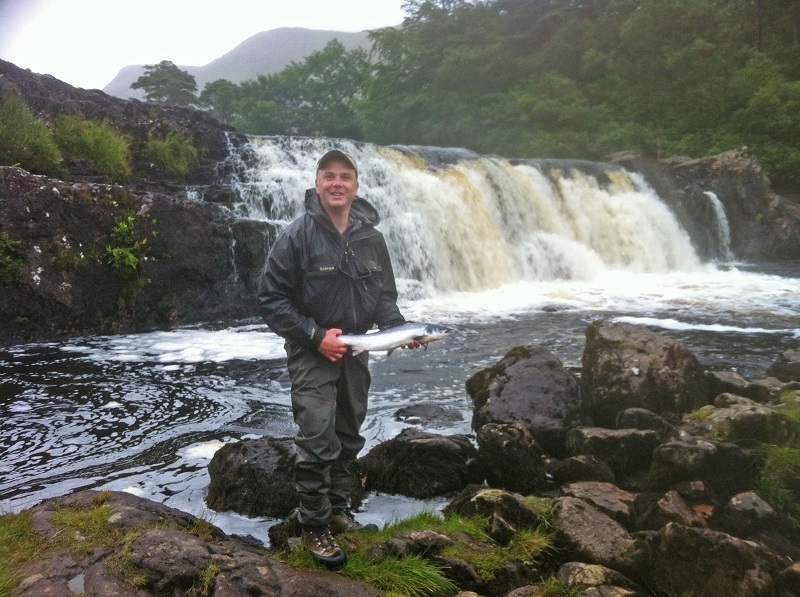 On Coolcronan, Stuart Turner, UK, caught 2 salmon at 6 lbs. each on worm, while Alan Culley from Northern Ireland had a ten pounder on Gannon's, also on worm. German visitor, Hans Thomas Kemp, did very well on the Cloongee Fishery where he had 8 grilse (5 released) on worm and spinner. Stuart Turner, who had already been successful at Coolcronan also scored on the East Mayo water with another grilse; this time on bubble and fly. Also on East Mayo, flyangler Des Edwards from Northern Ireland had a fine 9 lbs. salmon. Very high water levels impacted on angling for most of the week on Ballisodare with the worm being the most effective method. However, towards the end of the week when levels dropped, flyanglers enjoyed some good sport mostly upstream of the Falls. The fishery produced a total of 45 salmon for the week, twelve of which were released. Amongst the successful anglers were brothers Hugh and Noel McKeever who had a good day at the Falls catching 3 fish between them averaging 5 lbs. Swiss visitor, Luciano Cipolli, had a grilse at Harrison's on worm, while Aiden O'Conner, Ballisodare & Galway, caught the heaviest fish of the week, a fine nine pounder at the Falls. Bernard Harte, Joe Power and Aiden Heffernan all had fish on the fly upstream of the Falls later in the week. Angling guide, Kenny Sloan, reported that visiting angler Michel Fantone from France had great sport pike fishing around the Foxford area. Despite the poor weather conditions with high winds and hail showers Michel had 5 pike in total mostly on trolled lures, best at 93cm. Michel Fantone, France, with a nice Moy pike. To book a day's guiding or boat hire contact Kenny Sloan on +353 (0)949256501 or +353 (0)87 9670310. Declan Gibbons reports there is plenty of action still to be had on Corrib, with anglers having excellent sport. In the Cornamona area Martin Kinneavy reported on the TAFI Youths Connacht Cup which Cornamona anglers hosted last weekend, run on a catch and release basis. First place went to young Loughrea angler Ciaran Reilly who caught 5 trout. Second place went to young Oughterard angler Liam Butler with 2 fish, and third place went to young Headford angler Ciaran Flaherty. 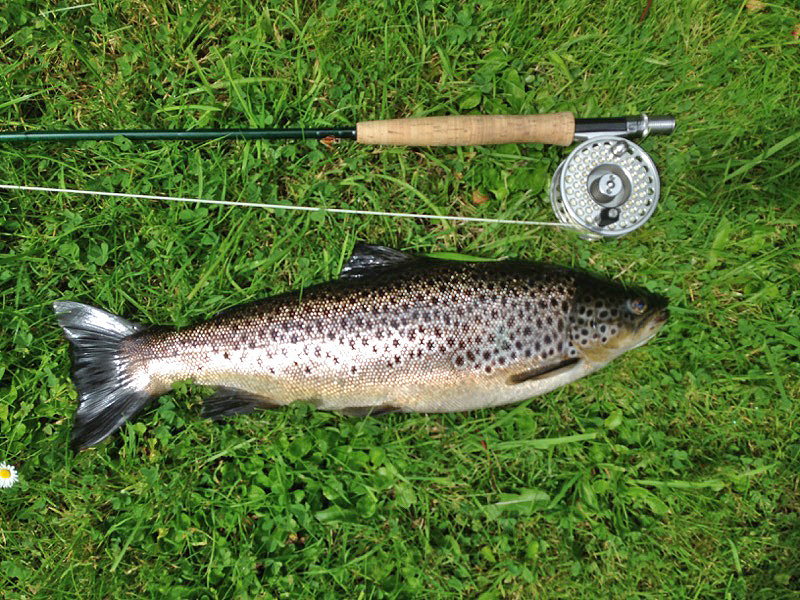 Staying in the Cornamona area Tom Doc Sullivan (087-6113933) reported Oliver Dillon and Seamus Brogan had a great day;s fishing on Wednesday last, landing 12 trout - 6 of them over 13 inches - on a mixture of wet and dry mayfly patterns, with the best fish being 2.5lbs. In the Oughterard area the Martin Molloy Memorial Cup was held out of Baurisheen on Saturday, with 40 anglers participating and weighing in 45 trout. First place went to Gerry Molloy, Glann with 3 trout for 3.395kgs. Second place went to Mikey Molloy, Baurisheen with 4 trout for 2.850kgs.Third place went to well-known Renvyle angler Jackie Coyne with 2 trout for 2.740kgs. The Junior winner was Darren Keeler with one trout weighing .940Kgs. Kevin Molloy of Baurisheen Boat Hire and Guiding (087-9604170) reported good fishing during the week. On Wednesday last French father and Son Mr P. Sauuwaert were trolling for the day and landed 5 trout. On Thursday visiting UK angler James Campbell (16 years old) had 2 trout on wet fly, best of the two fish being 2.75lbs. On Friday another young visiting UK angler - 17 year old James Costello - out fishing with his father landed 2 trout trolling, best fish 5lbs. On Sunday last as part of Headfest a festival being ran in Headford, Kilbeg and District Anglers ran a mixed grill competition as part of the festival in which 15 anglers participated. The competition was run on a catch-and-release basis. First place went to David Scully, 2nd place went to Lauren McGrath, 3rd place Dylan McGrath, 4th place Mike McGrath and 5th place went to Fursey Kenny. In difficult conditions 3 trout, 5 pike and 3 perch were caught. Monday saw USA father and Son Jim and Zac Prendergast from Fort Worth, Texas enjoy a fishing trip on Lough Corrib with Frank Costello of Ashford Bay Boat Hire (087-2524253 www.ashfordoldschoolhouse.ie). They caught 2 lovely trout on wet mayfly patterns - one fish 1.8lbs and the other 3.6lbs. A fine well-fed Corrib trout taken by visiting father and son Jim and Zac Prendergast, USA, fishing with guide Frank Costello. Basil Shields of Ardnasillagh Lodge, Oughterard (091-552550) reports on excellent fishing on Lough Corrib at present. The Dargle Anglers from Dublin had a Catch and Release outing to Ardnasillagh over the weekend and caught 15 trout for 11 rods - best fish was 52cm. On Sunday Shannon anglers Glen O'Connell and Ger Carrick caught 6 trout on wetflies. John Fitzgerald landed 9 trout on Sunday. Dublin angler Larry Kelly and visiting Scottish angler John Jacks caught 28 trout for 5 days, all sportingly released, on wet and dry mayflies - best fish over 3lbs. Mark Patterson and John Malcom fished for 3 days, landing 13 trout - best fish 3.25lbs on dry olives. Fishery manager Osgur Grieve reports on fishing from 5th-9th of August. There were 11 salmon caught for this period. Tom Harrington had a great day on the 5th, landing 4 grilse weighing 5.25lbs, 3lbs, 3lbs, 2.5lbs, 2 of which were released. Ian Ferris had 2 grilse the same day weighing 3.75lbs and 3lbs. Joe Tierney had a nice grilse of 3.25lbs from Doyle's pool on a cascade. Neil Spellacy had a great day on the 08/08/15 catching 4 grilse of 4.25lbs, 4lbs, 3.75lbs and 3lbs using a Cascade and a Black Shrimp, 2 of which were released, he also had 2 sea trout of about 0.5lbs which he released as well. Neil Spellacy from Moycullen with a fresh August grilse at Aasleagh Falls on the Erriff. John Fleming, skipper of the Brazen Hussy, fishing out of Rossaveal, was in touch to report that blue sharks are now showing up in the area. On a trip last Tuesday they had 4 blues to the boat - including a fish of 50lbs caught by David Quirke. The largest on the day was 88lbs, taken by JP Kelly. John fished himself and had one approx. 70lbs and JP and Dave had one more between them. John also reported brilliant lure fishing for pollack, and they managed a few ling as well. With the improvement in weather John is planning more shark trips, and also does regular charter trips for mixed species. There are plenty of dates available. To book a day with John aboard the Brazen Hussy contact him on 087 7571320 or email johnfleming1990@yahoo.ie.